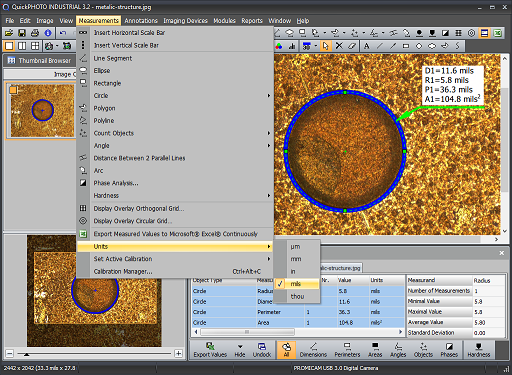 We are happy to announce the availability of new version of QuickPHOTO microcope software. The version 3.2 adds the option to measure in imperial units, which are commonly being used in US and UK industry. The users can now switch between micrometers, millimeters, inches, and mils (thou). The software has been localized to Traditional Chinese and is now available in 10 languages. The users of the most advanced program version – QuickPHOTO INDUSTRIAL – could appreciate, besided other improvements, the option to measure circle radius in addition to diameter, perimeter, and area measurement. The set of supported imaging devices has been expanded by PROMICAM 3-5CP+ and PROMICAM 3-4C cameras as well as by PROMICAM LITE 5 and PROMICAM LITE 10 entry level microscope cameras. See all changes and improvements of QuickPHOTO microscope software at release notes page. Download latest version of QuickPHOTO in Downloads section.